Extreme water pollution is common in Brazil, where the majority of sewage is not treated. Raw waste runs through open-air ditches to streams and rivers that feed the Olympic water sites ... Doctors urge foreigners heading to Rio, whether athletes or tourists, to be vaccinated against hepatitis A. The US Centers for Disease Control and Prevention also recommends travelers to Brazil get vaccinated for typhoid. 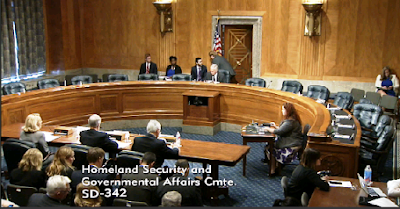 Yesterday's Senate Homeland Security and Governmental Affairs hearing with the telltale name "Avoiding Duplication: An Examination of the State Department’s Proposal to Construct a New Diplomatic Security Training Facility" was one of the oddest hearings I've ever watched. There was a weird combination of apathy - check out how few members attended this Full Committee Hearing - and anger. The anger came mostly from Claire McCaskill (D-MO), who was the only member to attend the hearing other than the majority and minority leaders and one Republican member, Joni Earnst of Iowa, who dropped in for just a few minutes. 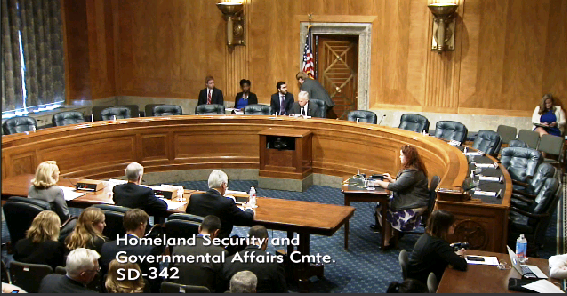 Gregory Starr, State Department Assistant Secretary for Diplomatic Security, who was there to get through a hostile hearing while he waits for support to come in the form of a Government Accountability Office (GAO) analysis of State's request to build a training facility. David Mader, Acting Deputy Director for Management and Controller, Office of Federal Financial Management, Office of Management and Budget. He was there to say as little as possible, but what he said supported the State Department's request. Connie L. Patrick, Director, Federal Law Enforcement Training Center,, U.S. Department of Homeland Security. She was there to be the Committee's pet, the responsible and cost-conscious bureaucrat who is just very excited to run the best gosh-darn joint law enforcement training center in the land, and could efficiently support any agency's training needs but got stiffed by those diplomats who want to have a training center of their own. The weirdness started when Ranking Member Tom Carper (D-Delaware) gave his opening statement and decided to tell the panelists "a quick story." In 2001, when I needed to buy a car, I test drove Porsches, Corvettes, and Mustangs, and I bought a Chrysler Town & Country Minivan. Well, yesterday, as I was driving than minivan across the Bay Bridge from southern Delaware, the odometer ran over 400,000 miles. He seemed to be a kindly old man. Chairman Johnson, unlike Ranking Member Carper, seemed to be a grumpy and suspicious old man, and one who gets confused easily. Apparently he's also a frustrated travel agent, since he challenged Starr on every nickle and dime of travel and lodging costs. Now, Fort Pickett is how many miles away from your headquarters? Let’s see … making some quick calculations on a pad … that’s a nickel a mile for private vehicle reimbursement … What's that? Oh, you’ll use buses? Never mind. Now, you claim you would have to spend 80 to 90 million a year in travel costs to FLETC in Georgia … dividing that by the annual number of trainees ... Mr. Starr, that’s way too much! That's not a believable number! Oh, that cost is for ten years? Never mind. Now, did you include lodging costs at Fort Pickett in these estimates, Mr. Starr? Oh, using hotels, are you? You could probably get a deal, what with all those thousands of trainees you'll send. Never mind. Mr. Starr, I have SO many questions! So MANY questions! What percentage of the guards around the world are foreign contractors as opposed to Marines? Starr explained that local guards - those are the ones posted outside the perimeter - are always foreigners, and Marine Security Guards are not interchangeable with local guards. Anyway, the hard skills center isn't for training either of those groups. McCaskill was having none of it. "The training you’re talking about is mostly perimeter training, right?" Starr kept a poker face where a less experienced witness might have blurted out what the hell are you talking about? McCaskill next took over Chairman Johnson's travel agent role and pointed out to Starr that a bus ride from Washington to Fort Pickett takes three hours, and a flight from Washington to FLETC in Georgia also takes three hours. So, obviously, the travel to either destination is identical. Try and talk your way out of that, Mr. Starr! McCaskill next badgered Starr over the incredibly trivial matter of how long it will take to drive a busload of trainees from Fort Pickett to the local hotels where they will stay during training. She was strangely obsessed with whether it will take twenty minutes, thirty minutes, or even longer. As if it mattered. FLETC Lady: We have a wonderful police training center in Georgia!!! We’ve already got a cafeteria, gymnasium, library, training venues, classrooms, computer laboratories, dormitories, and recreational facilities. And we can build any kind of law enforcement training facility that anybody could possibly want. We do law enforcement training for DS agents at FLETC. Hard skills, however, is not law enforcement training. FLETC is not what we need. It doesn’t have the space or the isolation to fire .50 caliber machineguns, fly large CH-53 helicopters, do explosive demonstrations, drive MRAPs, train at night, or train without causing noise and environmental problems. Ft. Pickett is where we can do all those things, and do them with our military partners such as Marine Security Guards, Marine Fleet Antiterrorism Security Teams, and Marine Security Augmentation Units, all of which are located in Virginia. Johnson: What do you say about that, Mr. OMB Guy? OBM Guy: Mr. Starr is correct. Starr: FLETC’s entire campus is about the same size as what we would build, except at Ft. Pickett it would be on an active military training base where we could practice interoperability with our military partners and be surrounded by thousands of acres of buffer zone that would prevent any intrusion on the local community. FLETC Lady: Mr. Starr says he has to train with military partners. Well, I just so happen to be looking into using part of an old military base right in Georgia for a safe place to fire those heavy weapons. The Marine Corps is going to use it, too. Marine Corps? That sounds like the same military that Mr. Starr likes to train with so much. For the wrap up, Chairman Johnson got out of the travel agent business and became all accountant. Johnson: Mr. Starr, I demand a full and complete accounting of every possible cost and business case analysis for this decision before I agree with you that Ft. Pickett is the best choice. Starr: Senator, the GAO is doing just such as study, at the request of the House Foreign Affairs Committee, and its report is due to be released in about one month. I’ve seen the draft, and I believe the GAO will support using Ft. Pickett. Johnson: Mr. OMB Guy, what do you know about that? OMB Guy: Mr. Starr is correct. In early 2014 it looked like the White House was going to scrap State’s plans for a multimillion-dollar, brand new diplomatic security training facility. Its budget analysts decided that the Georgia site was the cheaper option. But then Deputy Secretary of State Heather Higginbottom got involved. Higginbottom, previously deputy director of the Office of Management and Budget, reached out to her former OMB colleague, Steve Kosiak, who oversaw the national security and defense budget. According to an OMB analysis and e-mails between Higginbottom and Kosiak, the White House initially decided expanding the Georgia location made more economic sense, according to documents obtained by the Loop. “FLETC can meet the vast majority of State’s current requirements for access to facilities and course scheduling, training requirements, and life support services, all at a much lower estimated cost than Fort Pickett,” according to a late 2013 OMB cost analysis. It is not at all clear to me that the training facilities that FLETC was asked to cost out in 2013 are the same ones that State now plans to build at Ft. Pickett. As stated during the hearing, State's soft skills training will remain in existing in-house facilities for efficiency, rather than move to Georgia as per the FLETC proposal. And, as the FLETC Lady acknowledged, her facility in Georgia can't support night training, use of heavy weapons and helos, or interoperability with State's military partners. Is there really an apples-to-apples comparison that favors FLETC? State’s proposal would cost approximately $413 million, which is a dramatically scaled back version of an original $1 billion plan. FLETC claims it could develop the same facility for half that. Yet, despite the cheaper construction price tag, State argues that the money spent flying diplomats and their spouses to Georgia for hard skills security training would eventually surpass the savings. Plus, it’s less efficient since much of their soft skills training occurs in Washington and Virginia. State also contends that the Virginia site allows the diplomats to train alongside Marines at Quantico, who serve as embassy security. State merely “contends” that the Virginia site would allow for joint DOS-Marine training and the Georgia site would not? Well, Quantico isn’t moving to Georgia. It’s more like State pointed out the obvious. As part of OMB’s efforts to encourage the State Department to consider alternatives to new construction, OMB facilitated analysis of the Fort Pickett and FLETC options. OMB reviewed detailed proposals submitted by both the State Department and FLETC and coordinated interagency efforts to achieve a common understanding of the capabilities and requirements of each proposed facility. In addition, OMB facilitated further discussion between the State Department and FLETC concerning whether FLETC could provide the full suite of training courses and synergies the State Department was seeking to fulfill State’s diplomatic personnel security training needs. This was coupled with an effort by OMB to have the State Department closely review its cost estimates for construction of FASTC. 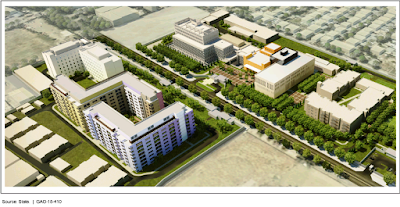 Even prior to this review, the State Department’s Bureau of Diplomatic Security was re-evaluating its plans in order to focus on hard skills training, de-scoping the original proposal from an over $900 million facility to a $413 million facility focusing on hard skills training, such as training with heavy weapons, explosives, and armored vehicles. These savings made FASTC construction more competitive and represented a better value for the taxpayer. Presumably the GAO report will say the same. Maybe McCaskill will have updated her bus schedules by the time the committee reconvenes. The Vancouver-based business announced it’s going to make something called “Curiosity Lager” ... The enterprise appears to take aim at the men’s yoga apparel market ... It seems that when it comes to reaching men, companies will try just about anything. Can the administration arm-twist Secretary Carter into approving more releases? What would be in it for him? Administration officials say their strategy is to keep cutting the number of prisoners, which started at 242 when Obama was sworn in and now stands at 127. When the tally drops below 100 and perhaps even as low as a few dozen, officials say, the cost per prisoner will zoom so high that keeping the facility open will be transparently foolish and lawmakers will abandon their resistance to closing the island jail. He feels very strongly about it? Well, I feel very strongly about buying my own stretch of prime trout-fishing river front someday. Let’s see who gets lucky first, me or Obama. “If Obama couldn’t win over Congress on this issue when the Democrats controlled one house, how much more likely is it he’ll be able to win over Congress when the Republicans control both houses?” asked detainee lawyer David Remes. By 230-184, the House cast a largely party-line vote last year to put a one-year halt on all transfers out of Guantánamo, a measure stripped out in talks with the Democratic-controlled Senate. Republicans now have 12 more House seats than they did last year and have gained a majority in the Senate. The numbers are against the administration on this, but I must say that's an interesting political strategy they have for turning things around. It is a well-known fact that our elected representatives hate to be associated with wasteful government spending. Why, I'm sure the typical Congressman would like nothing better than to get into a debate with an opponent who promises to spend whatever amount of money it takes to keep those prisoners in Gitmo and away from the United States. I mean, they would, right? de minimis non curat lex, the law cares not for small things? A Maryland lawmaker, 38-year-old Montgomery County Delegate Ariana Kelly, has been charged with indecent exposure and trespassing. In an explanation of the incident in the summary of charges, an Officer J. Herman writes that a cell phone video taken by Kelly’s ex-husband shows her repeatedly ringing the doorbell and exposing her breasts. 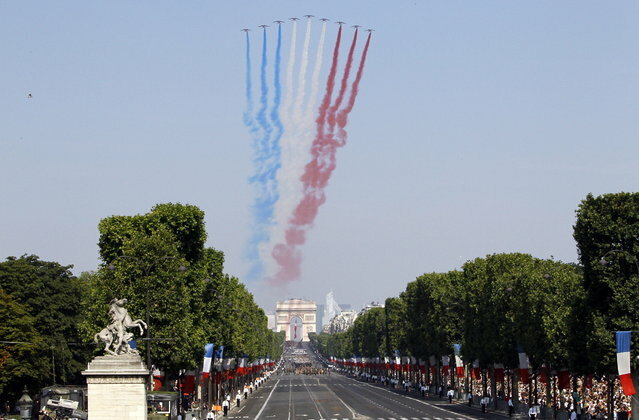 I like France, and I don't care who knows it. Bonne Fête Nationale, you French fellows. I wish I could be there. U.S. Marshal Pane said the Marshals Service is confident that the security integrity of the courthouse is intact. 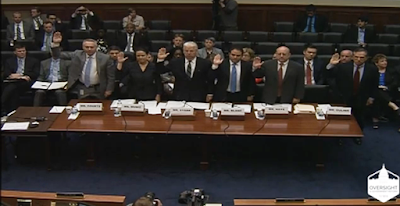 The hearing was unenlightening, and the performance of our elected officials met my low expectations. OBO Director Muniz, however, did much better this time than she did in last year's hearing on design excellence. The Committee website might link to the video in case you want to watch the hearing tonight. Personally, I'll be surfing Netflix. Ms. Muniz rebutted that by saying OBO did, indeed, do strategic planning, and re-planning as our national requirements in Kabul changed. She backed that up by noting that office space requirements grew from 500-some desks at the beginning of the endless Kabul project to over 1,000-some desks now. Also, there was the rather large matter of Pakistan closing its border and cutting off our main supply route to Kabul. Lots of material changes that were not known and could not have been anticipated when the project began, in other words. Courts' second big point concerned the State Department's rejection of GAO's recommendation that it create explicit security standards for application to temporary buildings. He noted that State says it applies the same standards to temporary buildings as to permanent ones, in so far as that is possible, and waives standards case-by-case when it is not possible. However, Courts went on, in his interpretation of State's position on temporary buildings, it is never possible to fully meet those standards except in permanent, or at least purpose-built, buildings. That one was more in Greg Starr's ballpark, and he answered it by saying that it is, in fact, possible to approximate or even fully meet security standards in temporary buildings. For example, by constructing a hard shell around a soft-skin trailer. Or by fielding hardened trailers that actually do meet 'permanent building' security standards albeit in a temporary platform. There is more than one way to get to the same level of physical protection, including down and dirty options that have been expressly developed for expeditionary situations. As he said in his opening statement, “simply put, our physical security countermeasures work.” And so they have, through several unsuccessful attacks on our presence in Kabul and elsewhere in Afghanistan. Chairman Jason Chaffetz returned again and again to blaming OBO for not implementing cost containment recommendations that were made in a 'value engineering' study of the Kabul project. Chaffetz, who opening the hearing by modestly claiming "I'm not an expert" about these matters, certainly played one on TV when it came to OBO's management practices. Like Chaffetz, I’m not an expert either - or am I? - but unlike Chaffetz, I have participated in value engineering studies, and I’m on Ms. Muniz's side here. She noted that no gain in cost containment from the VE recommendations would have outweighed the additional time imposed on the project as a result. What's more, any VE savings would have vanished in the wake of major impacts such as the closure of the Pakistani border to OBO shipments. No harm no foul. I completely agree with my good friends in OBO on this. In a normal construction project there is a time and a place for VE studies, but not so in an urgent, constantly changing, effort being conducted in a war zone. "So close your rule book on that one, Poindextor,” to quote White Goodman from the great movie Dodgeball. In other highlights, Representative Mica expressed amazement at the $2 billion cost of the Kabul projects, especially in comparison to the paltry Gross National Product of Afghanistan. "This must be the biggest infrastructure project in Afghanistan” he guessed. Well, maybe, except for the actual infrastructure projects that have cost USAID $17 billion since 2002, and the futher $21 billion in DOD's reconstruction spending (google Special Inspector General for Afghanistan Reconstruction report 15-40 SP for details). Did Rep Mica forget about those? It had been a long morning and was getting close to lunchtime, after all. Rep Lynch provided a refreshing change of pace during his question period by going in the opposite direction and asking why OBO doesn't add a helicopter landing zone to the Kabul project at this late date. There has not been enough infrastructure or construction costs yet for his taste. Late in the hearing, Chaffetz had the considerable gall to say that State's Assistant Secretary Starr was not testifying truthfully regarding, if I recall correctly, the matter of protecting temporary buildings. He offered to straighten Starr out in a classified setting. That's bold talk from some twerp who was a marketer for a Utah-based pyrimid scheme business before he got elected. If Congressional oversight hearings were not fundamentally a harmless form of Kabuki theater, Starr might have taken offense. Rep Ron DeSantis of Georgia broke ranks during his question period and frankly stated that he doesn’t care about Afghanistan construction costs. Instead, he wants to score a boondoggle project for his district by forcing State to place its new hard skills training center there rather than in Fort Pickett where it belongs. Starr explained why that won't work. DeSantis didn't care. His colleague from Georgia, Rep “Buddy” Carter, backed up DeSantis on this. Who the hell cares how much you waste in Kabul, he all but said, we want that sweet, sweet, money spent in Georgia. Towards the end of the hearing, Rep Russell wanted to know how Starr justifies the need for 5,500 USG employees to be located in Kabul in the first place. What? He wants Starr to justify that? He’s the elected official, so that question ought to go to him. What programs did he and his fellow Congressmen and women vote for? We have 5,500 people in Kabul because our elected representatives wanted them there. Actually, that was the whole hearing in a nutshell right there. The witnesses ought to have asked the Congressmen why our national mission requirements in Afghanistan have been repeatedly changed on them. Why have we been fighting some kind of a war in Afghanistan for four times as long as this nation was in WWII, and what exactly are we doing? Figure that out and you’ll have your answer as to why embassy facility planning wasn’t simple and consistent over those many years. It will be Must-See TV tomorrow morning when the House Oversight and Government Reform Committee holds a hearing on Kabul. Representative Jason Chaffetz will school OBO Director Lydia Muniz and Diplomatic Security Assistant Secretary Gregory Starr on how to do construction work in a war zone with maximum efficiency, because, you know, like, that's something he would know all about. Here's the hearing announcement: Construction Costs and Delays at the U.S. Embassy in Kabul. The stated purpose of the hearing is to "examine the State Department’s risk management practices overseas, focusing on construction of the new U.S. embassy compound in Kabul, Afghanistan" and also to "continue the Oversight Committee’s examination of safety and security of U.S personnel serving in embassies and consulates around the world." Here's the GAO report that will be the factual basis for the substance of the hearing. Cheffetz will supply everything else a good entertaining hearing needs, like melodrama and histrionics. Wasn't it all the way back in September 2014 that the White House had that fence-climbing intruder? The one who ran into the house despite all the security countermeasures in place to prevent something like that? 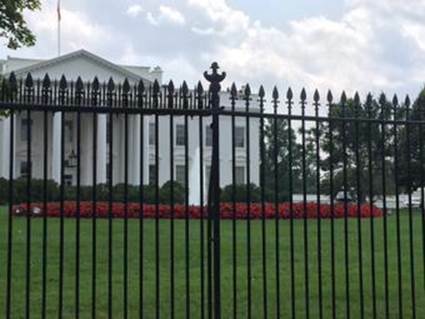 And the administration is only now getting around to doing some tangible security improvement to the White House fence? Better late than never, I guess. But, after nine months, you'd think they could have come up with something a lot more impressive than those tiny fence-top spikes. Those little things provide no appreciable gain in physical security, so far as I can see. Metal spikes were installed atop the White House fence today, the latest enhancement to fortify the security perimeter at the White House. U.S. Secret Service and the National Park Service mounted the "removable anti-climb feature" this afternoon, but the entire installation process will take six weeks. Designed by Rock Island Arsenal Joint Manufacturing and Technology Center, the metal spikes installed today are only a temporary and will be replaced once a long-term solution is implemented, officials said. Honestly, if a complete fence replacement is coming - someday? - why even bother with an insignificant interim improvement? WASHINGTON, July 3 (UPI) -- Parades, fireworks and barbecues are annual July 4 traditions. So are reports of terrorist threats. And that makes Americans less likely to take them seriously even though this year's situation is new, experts say. This week, the Department of Homeland Security, FBI and National Counterterrorism Center issued a joint intelligence bulletin to law enforcement across the U.S. warning of threats from extremists tied to Independence Day. "They can't not put out a warning, even if they have no indication of increased threat," said former FBI senior official Christopher Voss. "If an attack occurs, they would have no defense for not putting out a warning." Voss, Clarke [an associate political scientist who researches counterterrorism and the Middle East at RAND Corporation] and other homeland security experts said these raised alerts could be less about safeguarding the public than making certain that the government is on the record about the seriousness of the threat should something happen. "What's the alternative? Not take these things seriously then have something happen? If it ends up being overblown, I'll take that 10 times out of 10 over the alternative," said Clarke. Thank You, noted Homeland Security Experts Voss and Clarke, for adding a moment of honesty amidst the panic-mongering of this latest baseless threat warning. Indeed, what is the alternative to DHS, the National Counterterrorism Center, and the FBI all covering their collective asses by issuing vague warnings about non-specific threats? I guess the only alternative would be to say nothing when they have nothing to say. And then where would they be? Here are news reports of two previous warnings, from November, 2007, and October, 2008. The warnings always follow the same script. Timing is critical, since you want the threat to sound like it is imminent, but under no circumstances do you want it to be specific or linked to a certain date, like, 'next Monday,' otherwise people will start keeping track of how often these warnings are duds. The latest warning covers "the forthcoming holiday season," which is a nicely broad time frame. By the time the holiday season is over, we'll have new things to worry about and will have forgotten that something or other was supposed to have happened in New York. I think that bit of bad poetry still holds up! BTW, nothing happened after that old threat warning, just as nothing will happen after this new threat warning. That's a bold statement, I know, given that anything can happen in this crazy world. But I do not live my life in a constant state of fear, and I hope you won't, either. Notice how that "analytical note" of a threat warning from November 2008 could be substituted word for word for today's July Fourth warning. That kind of language - no specific details ... an attack could possibly be conducted ... while federal agencies regularly issue all sorts of advisory warnings, the language of this one is particularly blunt ... the warning was issued out of an abundance of caution going into this holiday season - is meaningless and therefore endlessly repeatable for occasions of every sort. Have a Happy Independence Day weekend, my fellow Americans. I'll see you all on Monday.